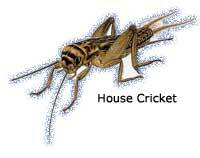 Adult house crickets are 3/4-1 inch long, light yellowish-brown with 3 dark bands on the head. They will eat almost anything, often causing damage to woolens and silk. Crickets are nocturnal, hiding during the daytime but becoming active and vocal during the night. The "song" or chirping sound of the house cricket is welcome anywhere except in homes where the constant night time (and daytime) chirping keeps humans from getting sleep. Crickets can be found in basements, crawlspaces, kitchens, fireplaces, behind appliances, behind baseboards and other cracks, crevices and wall voids. It is in these voids that a professional bait should be used.